Looking for great apps at a fraction of their regular cost? 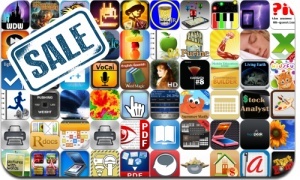 We’ve found 70 iPhone and iPad apps that are currently on sale. This app deal alert includes Pix’n Love Rush DX, Circuit Sidekick, European War 2, Worms 2: Armageddon, Folder Plus, Starry Night Interactive Animation, Paint Studio, Clap Box, iLightningCam, Self Timer, and many others.